Bellevue Botanical Garden, founded in 1992, is a crown jewel of the City of Bellevue’s Parks system. 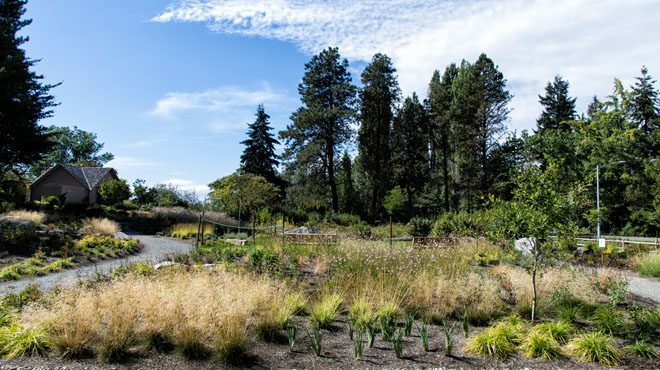 Located one mile from downtown Bellevue, Washington, the 53-acre garden includes 40 acres of preserved native forest. The remaining 13 acres contain distinct gardens tied together with a cohesive design and goal. The Garden fosters community and educates gardeners throughout the Pacific Northwest. For years, the Garden flanked Main Street with a large lawn. After construction of the new visitor center in 2014, the soil in the lawn was compacted to nearly solid clay, which sloped toward the building. A wetland was added for mitigation, but water became a constant challenge in the lawn—the turf was soggy and hard to walk on year-round. With over 300,000 visitors every year, and a brand-new LEED® Gold-rated visitor center, the street-facing lawn that served as our “welcome mat” matched neither our aesthetic nor our mission to feature the best garden plants and practices. Here was a chance for a more interesting garden to blend with the new wetland and offer an opportunity for interpretation. We decided to replace the turf with a meadow-inspired landscape. We envisioned an inviting, naturalistic design planted with a mix of natives and exotics, teeming with pollinators, a mason bee box, and the central wetland. The visually soft planting would contrast with the modern building designed by Seattle-based Olson Kundig Architects. Thus, the Urban Meadow was born. This glimmer of an idea came together through the inspiration and sweat equity of our partner organizations, along with the generous financial support from the Bellevue Botanical Garden Society, tribute donations, a grant from the King Conservation District, and in-kind support from the City of Bellevue with equipment and staff time. The new meadow lies in the heart of the Garden next to the new Iris Rain Garden, the existing Rock Garden, the Courtyard adjacent to the visitor center, and the Waterwise Garden. To create a sense of continuity, the new space needed to draw on all of these plant palettes. We also wanted a new path to move visitor traffic into the Urban Meadow, changing the way visitors access the Garden and alleviating pressure on the more sensitive Rock Garden. We asked Jil Stenn, designer of the existing Waterwise Garden, to design an Urban Meadow. Jil has been integral in the ongoing maintenance and preservation of plantings in the Waterwise Garden over the last 25 years, and her input ensures that the new meadow seamlessly flows into the surrounding plantings. Urban Meadow design and drawings: Jil Stenn, Stenn Design. Jil worked with garden manager Nancy Kartes and staff botanist Alex Wright, with advice from local wildlife gardeners and entomological societies about pollinator plants for our region. After evaluating many compelling ideas and finalizing the design, we turned our attention to how to transfer the ideas from paper to ground. We planned to break ground in early March 2017 to get plants in the ground before the weather warmed and complete the Urban Meadow in time for the Garden’s 25th anniversary celebration in early June. However, record-breaking rains saturated the site. We delayed work as long as we could, but eventually had to start despite soggy conditions. To prepare the site, we removed the sod and some of the poor soils left behind from construction of the Visitor Center. We added drainage to guide water away from the planting beds and paths and installed irrigation. Finally, we brought in rocks, boulders, and soil to replace the poor soil that was removed. The Garden is lucky to have many volunteers and partner organizations who share in our work. Members of our partner groups donned wide-brimmed hats and rubber boots and assembled for work parties over three weeks in May to install hundreds of plants. At the end of one particularly rainy work party, the volunteers came and thanked us. They were donating their time, and they thanked us? They were happy to have their hands in this project and to be a part of the newest display in the Garden. Volunteers planted most of the plants in the Urban Meadow. Together, they donated over 100 hours of their time to bring this garden together. One group of volunteers planted the area around a Sugar Tyme® crabapple (Malus ‘Sutyzam’ SUGAR TYME), a tree which they donated in memory of a loved one. Our mason bee house was built as part of an Eagle Scout project, and the bees were donated and are cared for by a local mason bee expert. Arguably, the most iconic plants in any meadow are the grasses, and we planted several varieties, from beloved stand-bys to exciting experiments. Our enduring favorite is Bouteloua gracilis ‘Blonde Ambition’. It’s among the tidiest of bunchgrasses in leaf, and its persistent seed heads catch the eye until we reluctantly cut them back in late winter. Playing in the wind behind the diaphanous grasses are white billows of Gaura lindheimeri ‘Whirling Butterflies’. This long-blooming perennial grows in the neighboring Waterwise Garden and continues in waves down to the urban meadow, drawing the eye across the landscape. Iris sibirica ‘Blueberry Brandy’ was originally planted at the opposite end of the Iris Rain Garden, and when it first pushed up its vivid blue flowers, we knew we had to have more. It now snakes through a persistently wet spot at the center of the meadow. We spent quite a bit of time tracking down Lonicera hispidula for the native plantings around the wetland. This West Coast native honeysuckle was highly recommended by several local wildlife gardeners, since its short pink flowers are more useful to bees and other insects than species with longer flowers. It will form a lax, semi-evergreen shrub in the absence of trees to climb, so we planted it along the fence to provide structure. As expected, we had challenges as the garden grew. The Anemanthele lessoniana were rootbound in their pots and had a difficult time establishing. Astilbe ‘Vision in Red’ suffered through the first hot, dry summer. Symphyotrichum (aster) ‘Purple Dome’ was eaten to stubs by rabbits. We included a small patch of no-mow lawn as a gathering spot, but the grass was eaten by rabbits as it germinated; what grass did grow contracted red thread fungus. Not to be discouraged, we replaced the Symphyotrichum with Aster ×frikartii ‘Mönch’, which a longtime friend of the Garden recommended as nearly rabbit-proof. We fertilized the lawn to grow out of the red thread and overseeded after the weather cooled in the fall. The heat-damaged plants were replaced with Asclepias incarnata ‘Cinderella’, a dwarf milkweed, but we didn’t foresee that the deer would develop a taste for it! We’re still watching the Anemanthele and the Astilbe. Every gardener knows the feeling of watching a promised plant languish. We also know that with that disappointment comes an opportunity for more plants! On June 10, 2017, we celebrated the Bellevue Botanical Garden’s 25th anniversary, honoring the contributions of so many groups in the creation and preservation of the Garden. Longtime friends, neighbors, visitors, volunteers, and partners came to share in the Garden’s success. We put the finishing touch on the new plantings during the celebration when community and garden leaders stepped up to their golden shovels to plant a Nyssa sylvatica ‘Wildfire’. Then we cut the ribbon, and the new Urban Meadow was open to the neighborhood. Later that summer, volunteers who worked on the project came for an intimate evening in the Garden to admire their work as it filled in. This project enlisted the energy and ideas of many people in our talented, innovative, and committed community. In just over a year, we turned our front lawn into an oasis for garden visitors and for pollinators. No longer a soggy field, our welcome mat is now a flourishing meadow. The project would not be as successful, or comprehensive, without the support and engagement of many community partners. We are especially grateful to the Bellevue Botanical Garden Society and the King Conservation District for their financial support and commitment to this project. And to all the city departments, community volunteers, and individual donors who gave to the project, thank you! While planning this project, we had the opportunity to completely redo the 420-foot-long streetscape adjacent to the visitor center and the new Urban Meadow. Cedars and cottonwoods that had lined the street since before the Garden was built were unhealthy and suckering into the Garden. We embraced the opportunity to make the streetscape a botanically interesting design that uses good horticultural practices. Low-maintenance, hardworking plants that are more diverse than a standard streetscape palette make sense aesthetically, economically, and environmentally. It’s also a model that can be replicated around the city. We looked long and hard for several large snakebark maples (Acer davidii), but weren’t successful. Instead, we chose Zelkova ‘Village Green’ to form a line of trees underplanted with a swirling tapestry of blocks of varying textures and shades of green. We broke the line of green with three × Chitalpa tashkentensis ‘Pink Dawn’ and a bench surrounded by hardy Gardenia jasminoides ‘Chuck Hayes’ as a tribute to Lisa Scott, our recently departed friend and long-time BBG Volunteer Program coordinator. Fittingly, the first flowers on the chitalpa opened on her birthday.